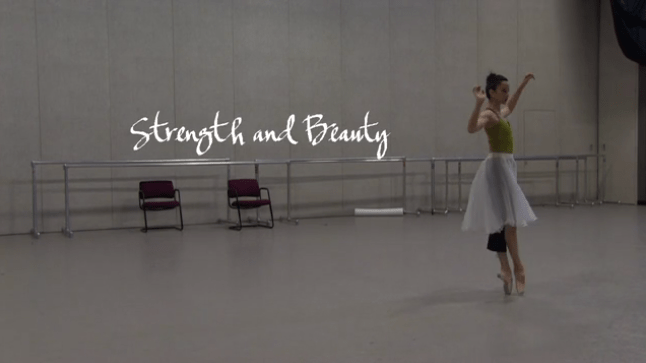 The short film Bookin’ and documentary feature Strength and Beauty worked together to explore the art of dance from different and interesting angles. Bookin’ brought dancers from two different worlds in Memphis, Tennessee, together to create a brand new art form, while Strength and Beauty explored through the journeys of three different women the realities of being a professional ballerina. Following the films was a talkback moderated by Cindi Boiter of Jasper Magazine and featuring dancers from the Columbia City Ballet as well as the director of Bookin’, John Kirkscey of Memphis, Tennessee. Bookin’ is an excellent piece on collaboration: collaboration between dancers, between dancers and musicians, and between dance and film. “Jookin” is a style of dance indigenous to Memphis and born out of “gangster walking,” described by the dancers interviewed in the film as the movement drug dealers would do in the clubs. Over time it evolved and became more complex and sophisticated, incorporating toe-stands and slides a la Michael Jackson. Kirkscey was born in Memphis and moved away for a while, but upon returning to his hometown found himself inspired by the jookin scene, attending battles that pitted both male and female jookers against each other. These battles inspired local DJs to create music with jookin-specific beats, which in turn inspired jookers to create new moves. In Kirkscey’s film, two classically trained ballet dancers and two jookers come together to meld their styles of ballet and jookin into one cohesive new style, hence, “bookin”. While they recognized the similarities between ballet and jookin, such as going up on the tips of their toes in either pointe or tennis shoes, both teams of dancers admitted to having a lot to gain from working with each other. The jookers acknowledged their more aggressive style would be benefitted by the grace of ballet, while the ballet dancers were excited to infuse the attitude of jookin into their classical form. At first, said Kirkscey during the talk back, this collaboration and its end result was the sole focus of the film, but he made the decision to go back and add more interviews to the beginning of the film exploring the history of jookin and its rise in Memphis. I was surprised to hear this, as it seemed a crucial element to the film, so this was definitely the right call on Kirkscey’s part. His method of incorporating music into the film was also a strong choice. He called upon his cousin Jonathan Kirkscey, a cellist with the Memphis Symphony Orchestra, to compose an original piece of music for the dancer’s collaborative number that would incorporate the classical style of ballet and the jookin-inspired beats used by local Memphis DJs. The result was an innovative piece that, when heard for the first time by the dancers on the day they were to begin working together, inspired them to create their own. This dance sequence was shot in a few different locales, all of which served the authentic, Memphis-specific feel of the overall piece. The short film was successful in achieving what it set out to do, both in terms of melding ballet and jookin into one dance form and serving as a documentary about the rewards of collaboration. Up next was Chelsea Wayant’s feature length Strength and Beauty, which follows roughly a year in the lives of three professional ballerinas at the North Carolina Dance Theatre in Charlotte. My favorite thing about the film was how it gave each ballerina a clearly defined arc in a way that felt entirely natural and unforced. At three different points during the film, after each ballerina has reached a defining point in her story, the documentary style is interrupted by a beautiful outdoor dance sequence shot on Super 8 film, with that ballerina wearing something other than their usual leotard or tutu, and dancing a dreamy solo. (Photos can be seen here.) This made for some stunning visuals as well as valuable insight into each dancer’s inner life. The dancers in the film seemed deliberately chosen to illustrate two major issues in the ballet world: age and body image. There was the “old” ballerina, 39-year-old Traci who opens the film talking about how she feels about her upcoming retirement from professional dancing; the “fat” dancer (and please imagine the biggest, boldest quotation marks you can around these words), beautiful and fit 23-year-old Melissa, who often feels weak in her classical technique but shines in her contemporary work; and the “perfect” ballerina currently on her seventh season with North Carolina Dance Theatre, Alessandra. While the talkback following the films could have involved the audience more and been more tightly moderated in terms of time, it was insightful to hear what the ballet dancers had to say and exciting to be able to ask John Kirkscey directly about his inspiration for Bookin’. This entertaining, successful short and the thorough yet dynamic Strength and Beauty were well-paired to get the audience thinking about what it means to be an artist and what we have to do to keep our art careers and our art forms alive.